"Too busy to cook? A slow cooker and a can of beef broth gets you started on this recipe. 'Low and slow' cooking gives you a roast that shreds with a fork. As an added bonus you get great stock for beef gravy as a by-product! Serve with your favorite BBQ sauce and plenty of coleslaw." Cut roast in half. Rub each half with salt and pepper, and place in the slow cooker. Pour broth and coffee over the meat. Turn the slow cooker to Low, and cover. Cook for 6 to 8 hours, or until the roast is fork tender. Carefully remove the roast to a cutting board. Pull the meat off the bone with a fork. You may also chop it with a cleaver afterwards, if you like it really finely cut. 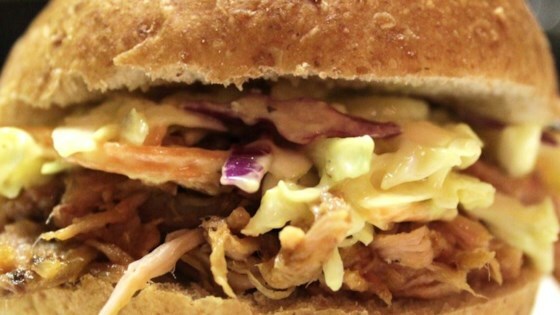 This pulled pork is so easy to make in your slow cooker.